mundane jane: Because if you don't laugh, you'll cry. At my house tonight, we are having Biden Burgers and Freedom Fries along with our debate. Our guest chef has even promised us a surprise Sarah Palin-inspired dessert. I hope it's some kind of chocolate mousse. 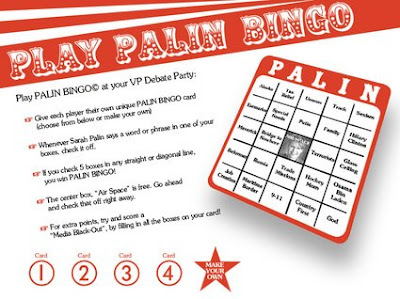 Because we all have productive activities scheduled for tomorrow, we probably won't be playing any drinking games--but we did print off our own Palin Bingo cards. Edit: And while waiting for the debate to start? The Obama Channel, of course (Dish Channel 73).